In the Glenmuir collection there are many beautiful designs in high quality real and merino wool, cashmere, cotton. A wide range of shirts, with the most classic and ever so popular, hard collar polo “Lowther”, mercerized shirts, technical, cotton pique etc – plain or with stylish designs. The collection has many beautiful designs, where you can feel the authentic lamb and merino wool, cashmere, cotton, etc. All made in high quality to withstand machine washing. Glenmuir offers a wide selection of pants, shorts, skirts, pirates etc. A wide choice to dress up any player from the top to bottom. 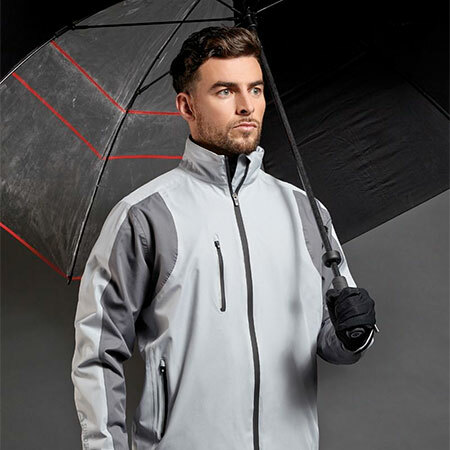 We provide a complete collection of windproof and waterproof garments with high quality fabrics and the best technology for any adverse weather.